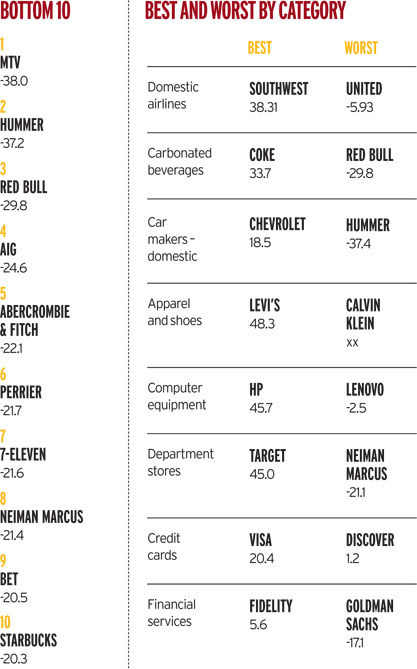 NEW YORK (AdAge.com) -- Which brand provides the best value for the dollar, Wal-Mart or the Discovery Channel? In a recent survey done by YouGovPolimetrix's BrandIndex, consumers rated the cable channel higher. It came in second only to Craftsman tools and was followed in third place by the History Channel. It just goes to show that in these unnerving economic times, consumers are finding the best value for their dollars in some surprising places. The survey was done in a 45-day period beginning Sept. 1 by the consumer-perception research service, which interviews 5,000 people online every weekday. It determined the value rankings by asking consumers, "Does [Brand X] give good value for what you pay?" Craftsman topped the list with a score of 64.7 and was followed by Discovery (63.3), History (62.2), Google (62.1) and Rubbermaid (57.0). A score of zero indicates equal results, and positive and negative feedback scores can range from -100 to +100. Aside from Google and Sony, the top 10, which also includes Home Depot (53.6), Lowe's (52.2), Toyota (51.5) and Black & Decker (50.7), lacks big-name, flashy brands such as Wal-Mart (41.8), Coke (33.7), Apple and Microsoft (both 29.6), McDonald's (12.8); and Starbucks (-20.3). "You see a lot of brands perceived as trusted and dependable [at the top]," said Mr. Marzilli. "In times of economic turmoil or any kind of crisis, people tend to fall back on what they know or what has been most dependable in their past." Not surprisingly, the financial-services industry didn't do all that well. The top-rated consumer bank was Chase (4.8) and the worst was Washington Mutual (-13.2). Other companies such as Merrill Lynch (-16.3), Goldman Sachs (-17.2) and AIG (-24.6), had negative scores. The top-rated airline was Southwest (38.3), and Toyota (51.3) was the top-rated automotive company.